More than IP lawyers. An IP law firm. Finnegan is an IP law firm, so whatever your industry or practice specialty, you’ll be at the center of the IP conversation. You’ll work on leading edge matters, with clients who turn to us for a distinctive, consultative approach. You’ll take your place among a team that includes more than 250 professionals with scientific degrees, more than 40 former U.S. Court of Appeals for the Federal Circuit clerks, and more than 230 professionals registered to practice before the United States Patent and Trademark Office, and you’ll collaborate with peer attorneys, technical specialists, and professional support staff in a culture that cultivates relationships, teamwork, and respect. As a Finnegan attorney, know that you’ll be at a firm with a powerful global track record of defending and advocating for the innovation of clients. It’s why Managing Intellectual Property named Finnegan its 2018 “U.S. Specialty IP Firm of the Year.” For Finnegan, global IP law is more than a zero-sum game of winners and losers. Innovation and rulings have multi- dimensional implications, and clients regularly turn to us for guidance as they navigate new or shifting IP terrain. If you work here, you’ll come to understand why clients prize the consultative relationships we build with them. Finnegan is about people. We cultivate respect for the contributions of every team member, and treat every person with genuine care, regardless of title or function. Our professionals are multilingual and multicultural, and they work with clients in real-time around the world. Your peers hail from locations ranging from Romania to Pennsylvania to Colombia to Taiwan. There’s a reason Vault ranked us #6 in Overall Diversity in its 2018 rankings. Find out why many Finnegan professionals spend their entire career here. As you lay the foundation for your career, know that Finnegan attorneys serve clients through 10 major IP practice areas and many additional sub-practices. We also follow innovation, with specialist teams focused on more than 20 industries that currently generate the bulk of global IP activity. As a Finnegan attorney, you can work at our Washington, DC headquarters, or at one of our other nine U.S. and international offices, all situated near innovation hubs in Atlanta, Boston, Palo Alto, Reston, London, Seoul, Shanghai, Taipei, or Tokyo. I can talk to any of their lawyers and know I’ll be in good hands. Finnegan believes that training and ongoing education are essential to developing the best attorneys and advocates for our clients. With multiple training and education components, our comprehensive in-house training program - LEAP (Learn Enrich Achieve Progress) is designed to enhance the firm’s existing training and mentoring activities that occur throughout the year. This highly-ranked program (#8 in Formal Training, Vault 2018) arms our team with the tools and resources necessary to practice law in an ever-evolving legal and business market. The LEAP calendar includes the following programs: Litigation training, advanced legal writing, advanced patent prosecution, PTAB practice, advanced technical and legal research, business development training and individualized coaching, billing and timekeeping, budget development, accounting for lawyers, persuasive speaking, law firm economics, presentation skills, leadership, management, and delegation. For those new to patent prosecution, Finnegan offers a prosecution bootcamp to introduce our newest professionals to the practice of patent prosecution. The bootcamp is supplemented by bi-monthly prosecution roundtables, in which Finnegan experts discuss developments in the law and how it impacts our day-to-day prosecution practice. Persuasive, precise, and compelling writing is something we strive for at Finnegan. Our writer-in-residence hones the legal writing skills of our attorneys through classroom teaching and one-on-one writing consultations. Sample classroom topics include brief writing, writing as an advocate, advanced legal writing, and writing as a non-native English speaker. Every other year, our top litigators teach an in-house litigation skills series, taking a litigation matter from its inception (how to develop case strategy with your client) to its conclusion (how to write and argue appellate briefs). These classroom programs are supplemented with experiential learning workshops, where you’ll learn about effective deposition strategies, how to interact with experts, and how to conduct cross- and direct-examination of witnesses. The capstone litigation experience occurs when you’re a senior associate - you’ll have the opportunity to participate in the University of Virginia Trial College, where you’ll participate in a mock trial from start to finish and learn from the best trial attorneys in the country. Our unique and highly acclaimed Litigation Mentor Program in the firm’s Washington office provides our attorneys with real-world courtroom experience. Attorneys handle criminal and civil cases in DC courts with the support and supervision of the firm’s full-time litigation mentor, Barbara Butterworth. Participants in this program have found that the intensive exposure to trial advocacy training imparts invaluable trial skills. Finnegan offers a comprehensive business-development training and coaching program for senior associates seeking to improve their practices and attract clients. The six-month program includes a preliminary assessment; group training sessions; individual coaching sessions; and related business development and marketing activities. Training begins as soon as associates join the firm. All new legal professionals participate in two weeks of training and orientation to familiarize them with Finnegan procedures and support resources. Every fall, all new associates visit our Washington office for Take the First LEAP, an intensive series of programs designed to give new associates a solid foundation in the fundamentals of intellectual property law as they begin their careers as attorneys. On the job training occurs through Finnegan’s ‘Second Attorney Review’ policy. No work product—not even routine correspondence—leaves the firm until at least two attorneys have reviewed it for format and substance. This one-on-one training under the guidance of supervisory attorneys is one of the best ways to develop our attorneys’ legal skills and ensure the highest quality of every aspect of our work. While we are fortunate to have many talented professionals in-house who are committed to training and coaching our attorneys, the firm also encourages our attorneys to attend outside professional meetings and educational seminars in order to enhance their legal skills. At Finnegan, you’ll find that the health and well-being of our professionals, staff, and their families are of the utmost importance. We offer a comprehensive, well-rounded benefits package to meet your health, financial, and educational needs and interests. How is the firm organized? The firm maintains a flexible, non-departmental structure that gives you the opportunity to practice in multiple, substantive legal areas (e.g., litigation, prosecution, counseling, trademark, copyright). You’ll be a member of a practice group based on your technical or legal background. One of the primary responsibilities of a practice group is to monitor the professional development of its members. What type of work will I get? The firm has a longstanding philosophy against "pigeonholing" attorneys into areas of practice. That means you’ll get to choose your own career goals and the paths you’ll take to achieve them. What is the formal (and informal) billing requirement? Our minimum billable requirement is 2,000 hours per year (including credit for pro bono contributions). There is no "informal" billing requirement for advancement toward partnership. Does the firm give credit for pro bono work? 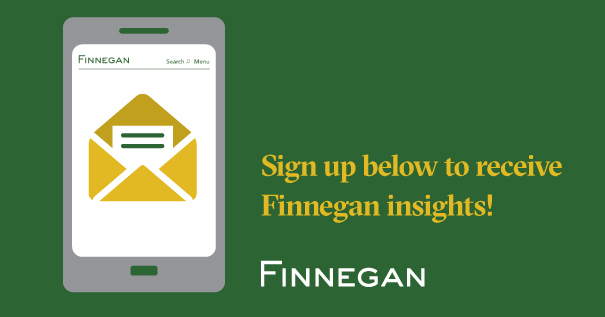 Pro bono work is an important part of Finnegan’s commitment to social responsibility. We also believe giving back is an opportunity to receive knowledge and experience, and the good feeling one gets from helping others. As a full-time attorney at Finnegan, 100 hours of pro bono work are credited toward you billable hours goal. If you choose more involved pro bono work such as litigation, the additional hours are rewarded and credited toward merit bonuses. Is there an advisor program? When you join the firm, you are assigned a partner advisor and a peer advisor. Your partner advisor provides formal performance evaluations twice a year and counsels you regarding your professional development. Your peer advisor introduces you to others in the firm, answers your questions, and helps smooth your transition into the firm. Does the firm offer alternative work arrangements? You may find that personal responsibilities and interests necessitate requesting a work arrangement that reduces the amount of time devoted to practicing law. We do our best to provide opportunities for both men and women who request alternative work arrangements. Attorneys in alternative work arrangements are eligible for and continue to progress toward partnership. Our day-to-day dress is business casual in most of our offices. Occasionally, you may be required to wear a business suit or comparable formal professional attire. What is the firm's diversity and inclusion policy? Finnegan is one of the leading companies in any field when it comes to the recruitment and retention of a diverse workforce. When you meet with us, you will quickly realize that Finnegan values diversity. For more information about our diversity and inclusion efforts, please click here. Does the firm have a good retention rate? Our retention rate ranks among the highest for firms of our size. It’s worth noting that many Finnegan attorneys have spent their entire career here, and that our current managing partner first entered the firm through the Student Associate program. What is the compensation schedule and under which circumstances are bonuses awarded? Annual compensation for first-year attorneys is $180,000 plus bonuses. In addition, attorneys who are billing and otherwise performing beyond the firm’s expectations are eligible for productivity and discretionary merit bonuses. If you’re interested in what we have to offer, know that we set a high bar. Also know that those who join us tend to stay for a very long time.